I have never really cared to stick to a monthly budget … they seem so strict. Instead of being frugal and not spending anything, I prefer our family to enjoy life and spend money on things we “want to afford”. That means if we want a house (which we do), then we are going to have a mortgage payment … and that is okay. It also means that if a cable bill just isn’t worth the service and value … then we are going to cancel it and save over $1,000 per year. For our family … it is more about deciding what is worth spending money on. Those things that are worth it to us … like healthy foods. And even though we are okay with spending money when it is right for us … we also want to save as much money as we can … so we can use it to generate more income. So … instead of following a monthly budget, we try and only buy the things we want to afford. Just because we don’t have a budget doesn’t mean we live above our means. In fact … we always live below our means … no matter what. In order to stay informed, we have been tracking where our money is being spent at the end of every month. Where Did We Spend Our Money in May (2017)? Our ultimate goal is to push our savings category higher and keep everything else as low as possible. Months and years of doing this will lead to a boom in our net worth. Here is a high level breakdown of where we spent our money in May. We also keep a more detailed breakdown of these categories … but we will keep it all high level here. It has been a long time since our savings was at the top of the list for monthly spending. But we finally did it and pushed our savings very close to 25% of our income. Our long term goal is to save a minimum of 20% of our income every month … which takes a little sacrifice. Over the past couple of months, we have been inching our savings higher and higher. Now that we passed 20%, we hope to continue saving 20% to 25% of our income for the rest of the year. Note – This category is called “savings” but in reality it could be considered “investing”. We have a goal to bump our annual dividend income earnings up to $3,000 by 2018. In order to reach that goal, we need to invest new money into the stock market each month. Second on the list was no surprise at all … our housing expenses. This category will always fall towards the top of our monthly expenses. We have a 30-year fixed rate mortgage that will always be a monthly expense … until we pay it off or sell our home. Besides our normal mortgage payment, we did have some extra home maintenance expenses last month that were out of the ordinary. We have also been rounding up our mortgage each month to the nearest hundred dollars. It is only an extra ~$21 or so, but that money goes directly against the principal. It would be good if we could add another hundred dollars or so each month on top of what we are doing … but then we wouldn’t have as much money to invest. And investing is our #1 priority at this point. The “Other” category is basically a catch-all for remaining monthly expenses. It covers any kind of gifts or clothing we may buy … which usually isn’t a bunch. However, this month we spent a lot more than usual on gifts and school related expenses. This category also includes expenses for our 3 children. They all participate in their own activities and sports which can really add up. Hopefully during the summer months we can really knock this category down and add even more to our savings! I will continue to say it every single month … “I want our food costs being high“. I would rather it be higher than our housing and transportation expenses. Our family believes that the most important investment you can make is in your health. Not your home or cars. Not even dividend stocks … which I think are awesome. What is the point of working hard to invest and build sustainable income streams if you are not around to enjoy it one day? In order to invest in your health … you need to eat high quality foods that are nutritious. That normally means spending more money on organic, fresh foods instead of cheaper processed foods. This is one category (other than savings) that we want to be high. Just like our housing expenses, transportation expenses will be towards the top of the list of our spending each month. That is because we currently have several fixed costs … including 2 car payments. We are actually paying extra now each month on the principal for car loan #1. After buying a new car (car loan #2) earlier in the year … I am eager to get our other car loan off the books. Other than our monthly car payments, we also include gas to fill up our vehicles in this category. We didn’t have any maintenance or other transportation related expenses last month. Our utility costs were slightly down in May compared to April and March. While several of these costs fluctuate a little from month to month… most of the time the overall utility spending remains static. As we move into summer, we are spending less and less on heating our home and more on keeping it cool. May was one of those transition months where we used both heat and A/C. Overall though it was a much cheaper month to cut back on the combined cost. Besides electric/water/heat, we have a few other bills in this category like cell phones and cable/satellite. Our cell phone bills, cable and internet, etc. don’t change month to month. We cut back on our cable service a year ago and now can save over $1,000 a year. The recurring theme here is that I am still not earning much income from my online business ventures like this blog. And because of that, any “business” related expenses need to come out of our personal finances. One day very soon, I plan to move these expenses out of personal finances into business related expenses. Once our health and fitness blog starts earning some money! Most months, we don’t have medical expenses … which is what we want. Our philosophy is to spend more on healthy foods which will help to prevent higher medical costs down the road. This past month we had a dentist appointments, which our insurance covers most of. However, we still have a co-pay … which is where most of our medical spending went. 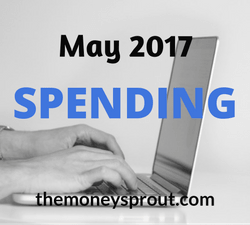 Now that we know where our money was spent last month, I wanted to discuss what we plan to do with our savings. We are not content letting our money sit idle in a savings account. There is no reason to be lazy with our savings … when we can invest in dividend growth stocks. Last year (2016) we earned over $1,900+ in dividend income. This year (2017) we plan to earn over $2,400 in dividends. We are living within our means … actually a little below it every month. As long as we continue to have savings every month … we are spending less that what we earn. But to us … living below our means is just not good enough. We want to live WELL below our means. To the point where our savings is at least 20% of our spending. It would actually be better if it were above 25%. By saving (or investing) at least 25% of our income, we can really begin to accelerate our dividend income stream. And while we are continuing to invest new money into dividend stocks each and every month … we want to do more. May was one of the first months in a while we were able to save (and invest) close to 25% of our income! That is a good starting point now for the months to come. Do you track your monthly spending? How was your May spending?